Everyone knows you need anti-virus software for your desktop and laptop, but what about your smartphone and tablet? After all, they connect to the virus-laden Internet, can be susceptible to malware sent by e-mail, text and direct message, and carry around your valuable personal information. In fact, the security risks to mobile devices are significant, particularly for those running Android, which is open-sourced. Mobile app security provider Lookout estimates that as many as one million people were affected by mobile malware in the first half of 2011. One mobile devices, you're just as susceptible to phishing, when a scammer sends an e-mail, direct message or text luring people to what looks like a legitimate site in order to induce them to reveal personal information, such as credit-card numbers or passwords. Mobile devices are also targeted by drive-by-downloads, when malware automatically starts downloading when a user visits a site. Scammers also use apps to attack people using mobile devices. They create a legitimate app in the Android market to attract a lot of users, and then release an update that contains malware. Since many users update their apps without much thought, either manually or automatically, scammers can hit a large group before the virus is detected. The risks to users from mobile malware include both information theft — from your address book, email and voice calls — and monetary damages. The GGTracker malware, which specifically targets U.S.-based Android phones through a drive-by-download, signs users up for a $10 text message subscription service that is charged to your phone bill. While there are stand-alone options for mobile devices, the latest trend in anti-virus software is “all-in-one” security that not only protects your main computer, but your smartphone and tablets as well. They can be a bit more expensive than piecing together your security with different products, you many find the added convenience of one-stop security protection worth it. 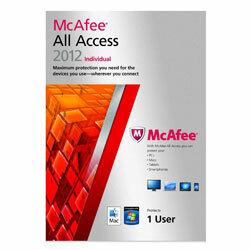 McAfee All Access is a brand new security solution for Windows and Mac that lets you manage multiple devices from one central console, using a single subscription. 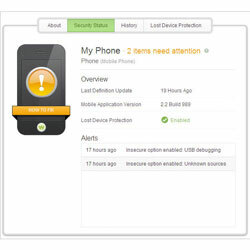 In addition to anti-virus protection, features include backup and data restoration on smartphones, tablets and PCs, remote tracking, locking and wiping of mobile devices, blocking of risky sites, as well as the ability to monitor what kids and teens are doing on social networks and filter inappropriate videos and explicit music lyrics. Price: $90.26 for an individual user and $123.56 for 5 users. Due in stores and online Oct. 17, Kaspersky ONE also protects multiple computing devices at once and works on Windows or Mac OS X, Android, Symbian, Windows Mobile or BlackBerry smartphones, and Android-based tablets. What’s different about Kaspersky ONE is the company sells it depending on how many devices you want to protect—a one-year license is $79.95 for three devices, $99.95 for five devices, and $149.95 for ten devices. So with the five-device Kaspersky ONE, for example, you could choose to protect your household desktop, two laptops, and two smartphones or two tablets, two smartphones, and a Mac, or any other combination that works for you. 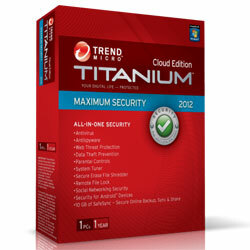 Trend Micro Titanium Maximum Security is a bundle of products put together to make sure all your devices are protected, whether you’re using Windows, Mac, iOS or Android. For only $55, you get a three-PC license, one license of Smart Surfing for Mac (worth $49.95) and Trend Micro Mobile Security for Android (worth $29.95). While Trend Micro has included security for Windows and Symbian devices for several years, its protection for Android devices is new as of mid-September and features an app scanner, surf, call and text security as well as lost device protection to find, lock or wipe your missing mobile device. With Titanium Maximum Security you also get Trend Micro SafeSync, which is a secure way to back up your files online, sync them between devices and access them using any Internet connection. It also gives you the ability to store sensitive files in a “vault” and remotely lock them in case your computer gets stolen. For Apple iOS, Trend Micro provides a link to its Smart Surfing app, which provides a secure browser to protect against Web threats. It’s free to anyone at the iTunes Store. Webroot SecureAnywhere was just launched and has already received PC Magazine’s Editor’s Choice Award, receiving 4.5 out of 5 stars. It includes protection for 3 PCs and 3 mobile devices for only $68.23. It includes 10GB of online storage to access files using any Internet connection and sync them across computers -- and in November, across mobile devices as well. The software also includes password management, which means Webroot creates and stores secure passwords to all of your favorite sites. You’re able to access those stored passwords from each of the devices you’ve protected. Webroot says what makes its product different is it’s fast and easy to use. While traditional antivirus software involves downloading a large definitions database, Webroot malware detection is done online. The small file you download acts as a ladder to the cloud and installs to your PC in six seconds. Wewbroot SecureAnywhere Complete can be used by one person with one license to monitor an entire family’s protection via its Web portal. While the software can work invisibly and automatically, high-tech users can also opt to use 124 customizable settings. All-in-one offerings clearly are where security companies are headed. Norton by Symantec will also be bringing to market a service for protecting consumers across multiple devices, but it won’t arrive until next year. Norton One will be a membership-based offering that will let members protect each connected device in the household, all managed from a single user interface. There might be reasons you’re not ready for a multi-device security solution, but you should still think about protecting your mobile devices, especially Android-based phones and tablets which are open-sourced and therefore more susceptible to attack than Apple’s closed operating system. For Android phone users, AVG Mobilation is a good bet. It’s free and finds your phone via GPS and lets you lock or wipe its contents if it’s lost or stolen. It also locks your apps with a personal password, blocks spammers and scammers and scans and removes viruses. For $9.99 you can get AVG Mobilation for your tablet at the Android Market. As for Apple devices, it is true they’re at less risk because of the curated nature of the Apple App Store, but Apple users who jailbreak their phones to load apps from outside the "walled garden" face risks. Not only that, studies have shown that up to 50% of iPhone users do not regularly sync their phones with iTunes, which is necessary to get security updates from Apple. iOS 5 allows over-the-air updates to resolve this issue, though users will still need to sync to update to iOS 5 first. Another threat is that files can flow through your iOS device into your computers at home and at work, by e-mail, or via remote locations. VirusBarrier iOS is a new app for iPhone, iPad and iPod Touch that lets you scan files on your iOS device for malware that could affect your other computers. While iOS doesn’t allow for scheduled or automatic scans, you can perform on-demand scans of files received by e-mail or on remote locations such as Dropbox. The app requires iOS 4.0 or later and is $3 for the first year and $2 for every year afterward. Being in IT, I know first hand what can happen to systems when they’re hacked into, so I installed Lookout Security on each of my family member’s Android phones when we switched over from iPhones last year. It works great. At work, I’m actually responsible for managing my company’s 3,000 managed mobile phones, so this is something I’m really interested in. Managing that many phones requires heavy management capabilities (policies, security scanning, etc.) that the consumer-focused products listed here (which are all great) can’t do in the business world. Some of the vendors we work with on our larger efforts are Good for management (http://www.good.com/), eEye for security(http://www.eeye.com/new-retina) and Trustwave (http://www.trustwave.com/) for encryption. For both home and business, the reality is that all-in-one solutions are really hard to find - depending on your definition of “all”.